The Supreme Court on Wednesday granted bail to five people accused in the multi-crore accounting scam at the erstwhile Satyam Computer Services, now called Mahindra Satyam. They include four former employees — G Ramakrishna, D Venkatapathi Raju, CS Srisailam and former internal auditor V S Prabhakar Gupta —- and S Gopalakrishnan, Satyam’s former auditor and a senior executive of auditing firm PriceWaterhouseCoopers. The five had approached the Supreme Court on August 30. A bench of Justices Dalveer Bhandari and Dipak Misra granted the bails. Gopalakrishnan was allowed to go home on production of a personal bond of about Rs2 lakh. The development could give hope to the three former key executives of Satyam — Ramalinga Raju, his brother and former managing director Rama Raju and former CFO Vadlamani Srinivas — still lodged in the Chanchalguda central prison in Hyderabad. Two other accused — Raju’s younger brother B Suryanarayana Raju and former PwC executive T Srinivas — were granted bail earlier. Raju, too, was granted bail earlier by the Andhra Pradesh High Court. However, the bail was cancelled by the apex court and Raju had to surrender in the court only to go behind bars again on November 10, 2010. He was arrested for his role in the accounting scam on January 9, 2009. While cancelling the bail pleas, the apex court had said that the accused would become eligible to seek bail if the trial in the case was not completed by July 31, 2011. The trial went beyond that and the five accused sought bail on the ground that the trial was not being conducted as desired by the apex court. It was the biggest Fraud in the nation and also in the corporate world. It is hard to believe that one of the largest IT companies, Satyam Computer Systems, underwent such a huge fraud case. Two brothers, Mr. Raju and B. Ramalinga Raju, who were the founder of Satyam Computer Systems were arrested for further investigation in the Satyam fraud case. The chief financial officer, Srinivas Vadlamani, may join the two brothers in jail because he resigned just after B. Ramalinga Raju resigned after the fraud case. The two brothers have been charged for cheating, criminal breach of trust and forgery. The Satyam Computer Systems is considered to be one of the leading outsourcing companies in India and it was among the top five IT companies in India. The company employs about 53,000 people and now the faith of these people is critical. And also many new engineers and technicians were recruited recently from colleges and universities in campus interview. It is doubtful whether the Satyam Computer Systems will be able to send the joining letters to all these new recruits. The Rs. 7,100 crore fraud case of Satyam will give awareness to all the companies that there must be transparency in all the aspects within the companies. There has been a talk that some leaders of IT companies like Azim Premji will takeover the control of the company but it has not been finalized yet. If you just want to know more on how Ramalinga Raju started losing his attention from the company, then I can relate some more information about the background of the fraud case. Well, the two sons of Raju are investing in the real estate business and recently their real estate business was not in good shape. So, Raju started using the manpower and other resources for the Satyam Company for the welfare of his sons’ real estate business. Now the four main shareholders of Satyam Company were horrified by the changing behavior of Raju and they want the attention of Raju in his company. As a result of this, the company has some setback in the IT and outsourcing field as their main concentration slightly goes to the real estate business of Raju’s sons. Now Ram Mynampati is the interim CEO of Satyam Computer System and he is doubtful whether the company has enough funds for paying salaries to its associates for January. This is the biggest fraud case in the history of IT companies and Ram Mynampati is in a very critical situation handling the sinking company. On 10 January 2009, the Company Law Board decided to bar the current board of Satyam from functioning and appoint 10 nominal directors. “The current board has failed to do what they are supposed to do. The credibility of the IT industry should not be allowed to suffer.” said Corporate Affairs Minister Prem Chand Gupta. Chartered accountants regulator ICAI issued show-cause notice to Satyam’s auditor PricewaterhouseCoopers (PwC) on the accounts fudging. “We have asked PwC to reply within 21 days,” ICAI President Ved Jain said. On the same day, the Crime Investigation Department (CID) team picked up Vadlamani Srinivas, Satyam’s then-CFO, for questioning. He was arrested later and kept in judicial custody. On 11 January 2009, the government nominated noted banker Deepak Parekh, former NASSCOM chief Kiran Karnik and former SEBI member C Achuthan to Satyam’s board. Analysts in India have termed the Satyam scandal India’s own Enron scandal.. Some social commentators see it more as a part of a broader problem relating to India’s caste-based, family-owned corporate environment . Immediately following the news, Merrill Lynch (now a part of Bank of America) and State Farm Insurance terminated its engagement with the company. Also, Credit Suisse suspended its coverage of Satyam.. It was also reported that Satyam’s auditing firm PricewaterhouseCoopers will be scrutinized for complicity in this scandal. SEBI, the stock market regulator, also said that, if found guilty, its license to work in India may be revoked. 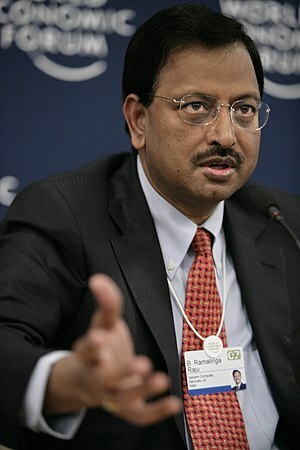 Satyam was the 2008 winner of the coveted Golden Peacock Award for Corporate Governance under Risk Management and Compliance Issues, which was stripped from them in the aftermath of the scandal. The New York Stock Exchange has halted trading in Satyam stock as of 7 January 2009. India’s National Stock Exchange has announced that it will remove Satyam from its S&P CNX Nifty 50-share index on 12 January. The founder of Satyam was arrested two days after he admitted to falsifying the firm’s accounts. Ramalinga Raju is charged with several offences, including criminal conspiracy, breach of trust, and forgery. Satyam’s shares fell to 11.50 rupees on 10 January 2009, their lowest level since March 1998, compared to a high of 544 rupees in 2008. In New York Stock Exchange Satyam shares peaked in 2008 at US$ 29.10; by March 2009 they were trading around US $1.80. The Indian Government has stated that it may provide temporary direct or indirect liquidity support to the company. However, whether employment will continue at pre-crisis levels, particularly for new recruits, is questionable . On 14 January 2009, Price Waterhouse, the Indian division of PricewaterhouseCoopers, announced that its reliance on potentially false information provided by the management of Satyam may have rendered its audit reports “inaccurate and unreliable”. On 22 January 2009, CID told in court that the actual number of employees is only 40,000 and not 53,000 as reported earlier and that Mr. Raju had been allegedly withdrawing INR 20 crore rupees every month for paying these 13,000 non-existent employees . On 5 February 2009, the six-member board appointed by the Government of India named A. S. Murthy as the new CEO of the firm with immediate effect. Murthy, an electrical engineer, has been with Satyam since January 1994 and was heading the Global Delivery Section before being appointed as CEO of the company. The two-day-long board meeting also appointed Homi Khusrokhan (formerly with Tata Chemicals) and Partho Datta, a Chartered Accountant as special advisors . On 13th April 2009, via a formal public auction process, a 46% stake in Satyam was purchased by Mahindra & Mahindra owned company Tech Mahindra, as part of its diversification strategy. Effective July 2009, Satyam rebranded its services under the new Mahindra management as “Mahindra Satyam” with a new corporate website http://www.MahindraSatyam.com. C.P Gurnani is the current CEO. As a result of the scandal, under the directions of the new Mahindra management team, Satyam Computer Services restated its financial results for the period 2002 to 2008. These restated results were published in September 2009.